On this page, you will find descriptions of different activities for the children. Many of the activites described here are designed for the older toddler/preschooler. Simultaneously, I do have a planned curriculum and activities for toddlers which are also available upon request. Arrivals - toys and books are available in the living room for use throughout the morning. In nice weather, older children may play on the deck. In the winter, birds on the deck at the bird feeder are also of interest. 9:30 to 9:50 - Circle time may include songs, rhymes, stories, games, rhythm sticks, language activities. O. 9:50-10:30 - Project time: could be science or art activity, a sensory experience, a game related to a math or language concept, etc. 1:oo to 1:30 - In cold weather, children may watch a short DVD, in warmer weather, older children may play on deck while I prepare for naptime. 4:30 to closing - Outside play, or small manipulatives at the kitchen table. Since opening in 1995, this schedule has varied to meet the needs of the children currently in care, and it will change again in the future I am sure. As I develop and implement curriculum for the children, I am attentive to ways of incorporating the Illinois Early Learning Standards to assure a child's success in kindergarten. I compile a portfolio of the children's work and my observations which I share with the parents. Literacy: Learning to read and write is actually a process that children begin in infancy when they first become aware of sounds and the world around them. 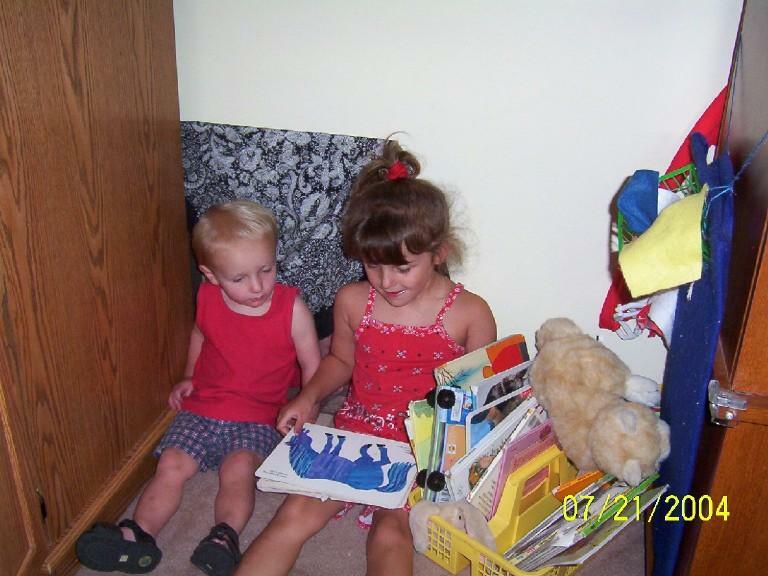 Children in my care are read to, talked to, and played with from infancy onward. 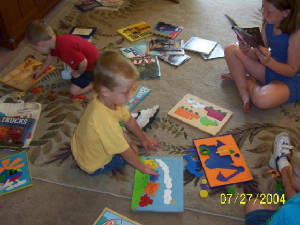 As children continue to grow and develop, music and rhyme, continued experience with books and language, and activities involving the ABCs are incorporated into the program. By the time a child leaves for kdg, s/he generally associates the letters with the consonant sound they make and is beginning to establish a sight word vocabulary. A children's librarian from Poplar Creek Library visits my home monthly for story time, bringing with her a large bag of books each visit which the children delight in. This is addition to the many books that are available to the children from my own collection. Health: At mealtimes, the conversation at the table is frequently about what the food we are eating does for our bodies. Hand washing is an important part of our routine, as is active play to encourage fitness and healthy hearts. Since rest is important for healthy, growing bodies as well as to provide energy and promote a positive mood, nap time is part of the routine here. Social Studies: Much of what I do with the children regarding social studies falls under the category of learning the values of our culture. I plan activities that require cooperation. I am also alert throughout the day for opportunities that may arise that would allow us to practice these values. I begin actively teaching problem solving once a child is three, hopefully encouraging the ability to see things from another point of view as I do so. I am always looking for ways to give the children opportunities to practice kindness, good manners, respect, responsibility and honesty. As opportunities arise, I also involve the children in activities that foster thoughtfulness and generosity to others in the community. Another aspect of social studies involved in my program include learning about jobs that different people within the community perform. Children are also generally quite interested in the machines we see in our community, trucks, train, airplanes, etc. Math: As is the case with all the curriculum areas mentioned, opportunities for developing mathematical thinking are woven into our day. Examples would be activities requiring the recognition and making of patterns, shapes, serration, comparisons, classifying, and matching and counting activities. Arts and Crafts: Time spent on crafts and process art give children the opportunity for self-expression and problem solving while developing strength and coordination in their hands needed for later school skills such as writing. 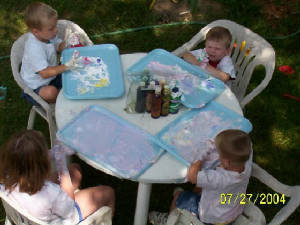 Plus, things like painting, gluing, cutting, using crayons, pen and paper, stringing, hole punching, etc are just plain fun. Music Music is an important aspect of our time together, it is woven throughout the curriculum from the thankful song before meals to bi-annual visits from a harpist. We enjoys songs, rhymes, rhythm instruments, CDs of favorite children's musicians, and stringed instruments such as a ukulele, lap harp, and my guitar. Music is great to move to as well, with scarves, a parachute, or dancing. Research indicates that it is an activity that stimulates all areas of the brain, In addition, music is an activity that works particularly well in a multi-aged group.